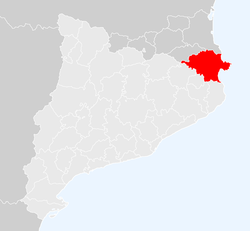 Alt Empordà (Catalan pronunciation: [ˈalt əmpuɾˈða], "Upper Empordà") is a comarca (county) in Girona, Catalonia, Spain, one of two into which Empordà was divided by the comarcal division of Catalonia in 1936, the other one being Baix Empordà. Wikimedia Commons has media related to Costa Brava. This page was last edited on 9 September 2018, at 12:45 (UTC).